When a business creates a learning system, it also needs a measurement plan to assess its effectiveness. A company training department, which is accountable to upper management, must prove that its employees have grown proficient in the tasks they’ve learned. Assessment is the tool that enables trainers to evaluate and improve their educational programs. Our current educational system, both in the academic or professional world, often relies on inappropriate assessment methods–for instance, the multiple choice test. 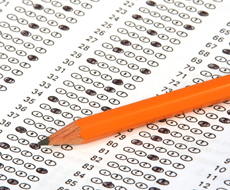 Multiple choice tests are relatively simple to create, administer, and grade. But these tests (and similar assessment tools that contain true/false and completion items) often try to quantify the unquantifiable. A high score on a multiple choice test doesn’t necessarily indicate a true understanding of the material. Often, it simply proves that the test taker is good at multiple choice tests. An effective assessment tool models how things work in the real world. Rather than testing random facts, it evaluates how the learner applies information on the job. For example, a pharmaceutical company wants to evaluate its employees’ knowledge of manufacturing a particular asthma medication. So it examines how skilled each employee is at operating the machine that blends the medication ingredients. Although this method is more complex than simply administering a written test, it paints a more accurate, useful picture of applied knowledge on the job. I can attest to the fact that high scores in multiple choice questions/test scores don’t mean that you learn or understand the material that is being tested. It means you are good at taking these types of tests. I recently took a certified auditor test and missed the passing score by 15 points. Does this mean I didn’t know the material, or did I? It would be good to research these facts in more depth so that you can see what is proven in past cases with different types of people.